With the auto enrolment of members and pension benefit statements moving online, registration for our pension service, Manage Your Account (MYA), has risen significantly in the last 12 months. Wanting to maximise on this, we've made improvements to both MYA video guides and employee communications to boost registrations further and build on member engagement. To help improve our member journey, we've recently made updates to our video tutorials introducing the service and guiding members around MYA. Videos 'Welcome to Manage Your Account', 'Investments' and 'How to switch and redirect' sit within MYA itself to aid the user through particular scenarios like switching and redirecting investments. While a new promotional video for our employee microsites gives a broad overview of what to expect and encourage users to register for the service. You can view our promotional video below. Our employee promotional materials are now editable, meaning employers can add their company logo and individual microsite URL to tailor them to their needs. 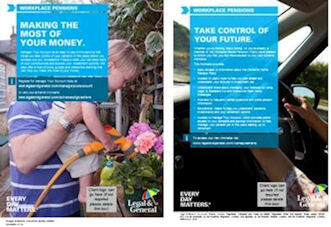 This includes posters: 'Making the most of your money' and 'Take control of your future' as well as leaflet: 'Keep an eye on things'. All posters and leaflets are available via Manage Your Scheme.